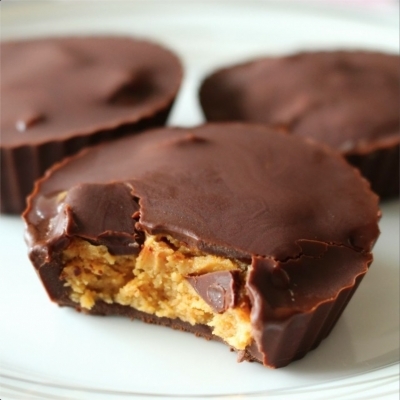 Like homemade Reese's cups with half the sugar and twice the protein! 1. In a small bowl, combine 2 tbsp vanilla protein and 1/4 cup PB2. Add 1/4 cup unsweetened vanilla almond milk and mix until smooth. Then add 3 tbsp peanut butter and mix until smooth. 2. In a small pan, melt 3/4 cup chocolate chips over low heat. 3. Add a small layer of melted chocolate to each of 8 silicone baking cups. Place on a tray and into the freezer until hardened, about 15 minutes. 4. To each baking cup, add a spoonful of peanut butter mixture and press lightly into the cup, leaving some space on the sides for the chocolate to fill in. 5. Top the peanut butter mixture with melted chocolate. 6. Return cups to the freezer until hardened, about 30 minutes. Remove from silicone cup and wrap in foil. Store in the freezer until serving.